The rambutan (Nephelium lappacium) is a close relative of the lychee and longan. The fruit flesh is enclosed in a red (or yellow) round to oval-shaped shell with long soft spines, giving it a “hairy” appearance. The flesh, which is translucent white, surrounds an oval brown seed and has a refreshing, sweet and mildly acidic taste. The rambutan tree is an evergreen tree growing up to 12–20m tall. Like all exotic tropical fruits, rambutan are labour intensive, as they require regular fertiliser, irrigation and pruning in order to maximise yields. Australian annual rambutan production is estimated at 750 tonnes, with a gross value of AU$6 million. Around 75% of Australian production takes place in far north Queensland, with the remainder in the Northern Territory. 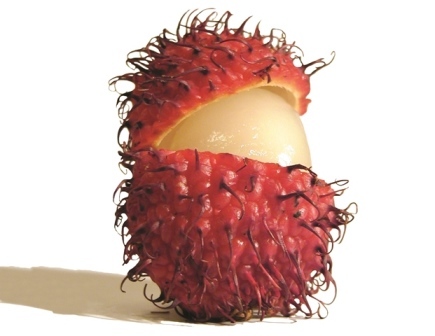 In 2000, Australian rambutan growers gained access to the Japanese market, where fresh rambutan is considered a luxury item. 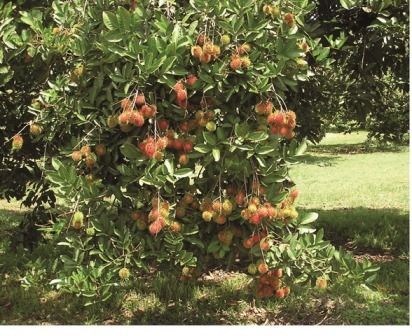 In recent years, Australian rambutan exports to Japan have declined to almost nothing, due to low Australian production caused by cyclone damage in 2006 and 2011 and the strength of the Australian dollar. 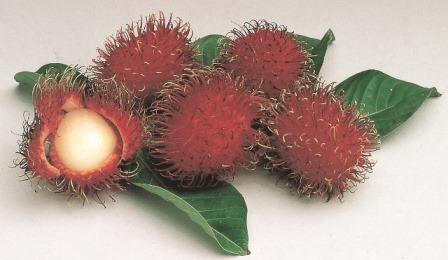 Importation of fresh rambutan into Australia is not permitted, however imported canned rambutan is available in Australian supermarkets. Rambutan seedlings were introduced to tropical north Queensland in the 1940s and commercialised in the early 1970s. 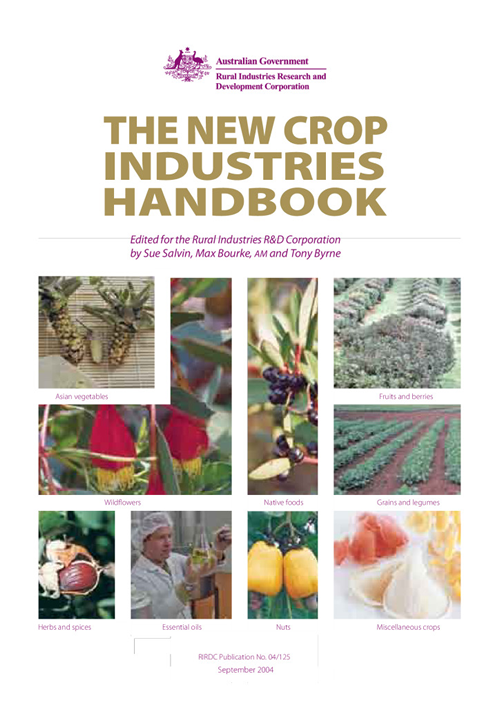 The industry is small and still developing, and its interests are represented by individual growers in north Queensland and by NT Farmers in the Northern Territory. 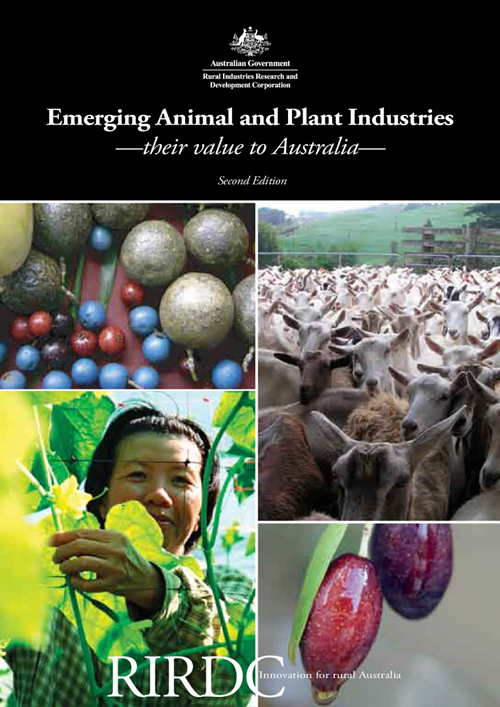 Australian rambutan production is estimated to be 750 tonnes, with a gross value of AU$6 million. Around 75% of Australian production takes place in northern Queensland, with the remainder in the Northern Territory. Rambutan production in Queensland was affected by cyclones Larry in early 2006 and Yasi in 2011, which destroyed many trees. Rambutan are generally eaten as a fresh fruit. However, it is also used as an ingredient in fruit salads, ice cream, sorbets or jams, and added to salads, cheese, meat platters and kebabs. The peeled fruit can also be canned. It is grown from Cooktown to Tully, along the wet tropical coast, in far north Queensland and in rural areas surrounding Darwin in the Northern Territory. Many trees from Bellenden Ker to Tully were destroyed during cyclones Larry (2006) and Yasi (2011). Rambutan prefer deep clay loam soils, however they have been observed thriving on a wide variety of soil types, so long as there is good drainage and no water logging. Rambutans are a crop native to the equatorial tropics in Indonesia and Malaysia and hence thrive in similar tropical climates. They require high, evenly distributed annual rainfall of 2,000mm or greater; and supplementary irrigation will be required during prolonged periods of dry weather. The tree requires high humidity, low evaporation rates and average minimum temperatures of about 20°C. 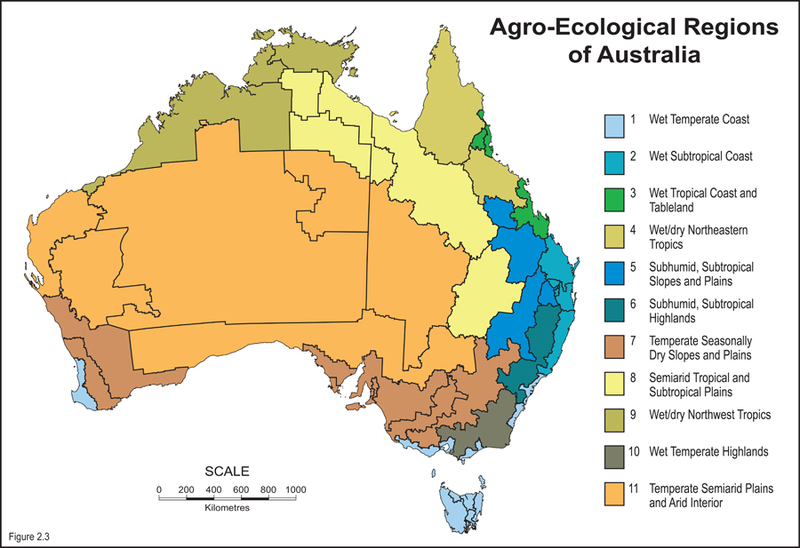 Neither of the main Australian production areas have the “perfect” climate but are sufficiently suitable. Planting areas must be protected from prevailing winds. Windbreaks are recommended to protect trees. Before planting, deep ripping of the soil is recommended and if the site is prone to waterlogging or ponding, mounding will be required. Seedling rambutans are not true to type and will most likely develop into male flowering trees. Rambutan are produced from clonal stock, either marcotts or grafted trees. Young trees should be purchased from specialist nurseries, to ensure varietal purity and freedom from disease. While rambutan were traditionally planted at low densities with row spacings of 10–12m or 70–100 trees/ha, since about 2000, there has been a shift to higher densities of 10 x 5m plantings or even 3 x 6m, resulting in 200–550 trees/ha. Young trees should be shaded immediately after planting. Mulch and irrigation should be applied at this stage as well. Trees aged 2–3 years will benefit from small regular applications of fertiliser high in nitrogen. However, fertilisers must be free of chlorine-based sources of potassium, which can cause leaf burn and fruit drop. Early pruning is necessary to establish the desired tree shape of a single trunk with three to four branches commencing at 0.5–1m above the ground. Rambutans are sensitive to water stress so irrigation will be needed during the dry season. As they are relatively shallow-rooted trees, small regular applications of water are more beneficial than a long soaking irrigation. The regular maintenance required, including pruning and irrigation, in addition to the need for handpicking of fruit, means rambutan, as with all tropical fruit crops, are considered a relatively labour intensive crop. Damage from birds and flying foxes is a major problem for rambutan growers in northern Australia, and many growers net their trees as fruit approaches maturity. 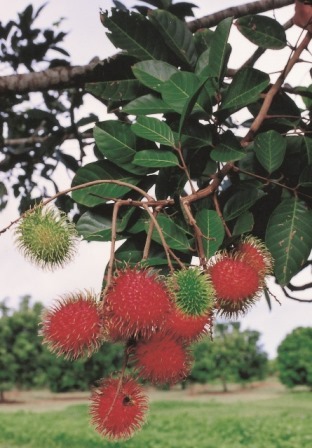 A wide range of insects may attack the leaves and fruit of rambutan. These include beetles, moths and caterpillars, red-banded thrip, mites, plant hoppers, mealy bug and scale. There is a restricted range of chemical controls available for insect pests and growers should consult with their advisors about options that are available. There is also a range of beneficial insects that growers should learn to identify and foster. Diseases are not as significant a problem for rambutan as birds, flying foxes and insect pests. However, rambutan can have their productivity affected by fruit rots, leaf spot and stem canker. Pruning of the trees to allow good air circulation and light penetration, along with careful use of a copper fungicide, will help reduce the impact of disease in the plantation. Please check the Pubcris Database on the Australian Pesticides and Veterinary Medicines Authority website to see if there are any chemicals are either registered or permitted for your specific crop or more generally for your crop grouping e.g. rambutan specifically or tropical fruit more generally. Once you have found the chemicals listed, view the label and follow the instructions according to the label. Production of rambutan requires an irrigation system, as well as cleaning, sorting, packing and refrigeration infrastructure. This infrastructure exists on most established horticultural businesses producing exotic tropical fruit. Exotic tropical fruits will also require shade infrastructure, particularly after planting. If the enterprise is established in a cyclone prone region, new growers may consider trellising their trees as a form of cyclone insurance. The economics of trellised rambutan has not been verified, however trellising does offer additional tree support during cyclonic winds. Rambutan grow in bunches of around 5–20 fruit and are harvested by hand. Rambutan can flower at any month of the year, so small amounts of fruit may be available throughout the year. 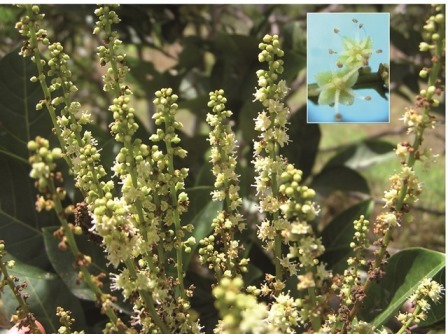 However, there is a peak flowering period. The season varies depending on growing location and climate with harvesting occurring as early as September/October in the Northern Territory and from November to April in northern Queensland, with small quantities of fruit also maturing as late as August. Rambutan ripen on the tree, therefore it is critical that they are picked at the optimum time, as they will not continue to ripen after harvest. The best time of day to pick rambutan is early morning, when the fruit is fully hydrated. Harvested fruit rapidly loses water therefore picked fruit must be kept moist and quickly transferred to the shed where it can be kept cool with water sprays, prior to grading and sorting. Grading and handling systems will vary depending on the size of the operation and proposed market. If packing into punnets, grading for size will be critical for efficient packaging. Rambutans are also packed into single layer trays and six punnet packs. Rambutan have a short shelf life, 1–2 days, before their appearance starts to deteriorate, at least on the outside, and they begin to lose their appeal. Packing to maintain humidity around the fruit and a cold chain (12-14°C) will extend the shelf life to 10–14 days. A strong relationship with specialist tropical fruit agents or direct marketing to buyers who understand these fruit is considered essential to selling rambutan successfully. Marketing options are varied and need to be carefully explored by new producers. Annual rambutan production is estimated at 750 tonnes with a gross value of AU$6 million. on-time delivery and consistency of supply. The need for on-time delivery and consistency of supply, usually at high volumes, can hamper exotic tropical fruit producers from actively participating in the larger horticultural market. As a result, many growers are marketing at a local level, for example selling at farmers markets or directly to restaurants. Some growers are investigating tourism opportunities through farm tours or farm gate sales. 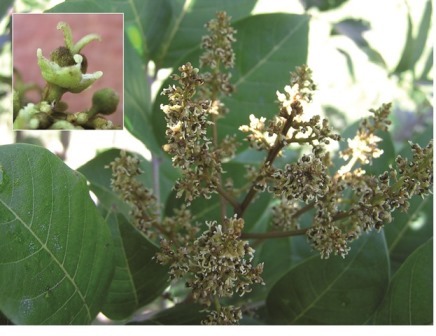 Research is also underway into potential value add opportunities for exotic tropical fruit. The supply chain for tropical fruit provides a useful framework for industry entrants to understand the potential marketing structure. It should be noted that while the supply chain is relatively short, the diverse array of participants and the need to move fruit quickly before it deteriorates, does add some complexity. These are not necessarily listed as a sequential supply chain, for example some growers will bypass packers and wholesalers and sell directly to restaurants or consumers. Wholesalers will also sell to secondary wholesalers, who in turn on-sell to smaller retail buyers and providores who may supply the food service industry. Traditionally, wholesale ‘central’ markets in capital cities were the major way to sell and distribute horticultural products. Supermarket and other retail buyers would visit and buy produce required, based on available supply. Now the large supermarket chains often prefer to deal directly with growers who produce larger volumes or alternatively with packers or agents who consolidate produce from a number of growers to ensure consistent supply. Factors affecting the price are seasonal availability, the availability of substitute products and consumer spending and preferences. Premium produce will generally earn a premium price, however, there are no guarantees of this always happening. For example an oversupply of high quality fruit will depress prices but equally, periods of low availability will see even average quality fruit command high prices. It is often suggested that one of the best ways to monitor price signals and plan production accordingly is the establishment of good business relationships between the grower and the wholesaler/agent. This can add some transparency around market signals. Like all tree crops, the biggest commercial risk to new entrants to the industry is the length of time between planting and the first harvest (three years onwards for grafted trees,) and poor fruiting in some seasons. Add to this that many exotic tropical fruit trees require significant upfront investment (land, sheds, irrigation, trees, netting and machinery), intensive management and a significant investment of time and energy, a return on investment may take some years to achieve. 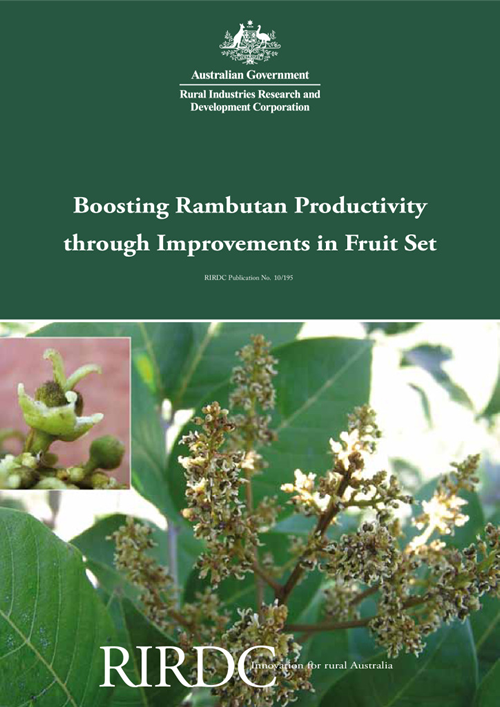 Most rambutan growers have an alternative income source, either on or off-farm. the challenges of understanding the marketing of exotic tropical fruits with limited information available. Rambutan have a relatively short shelf life and do not improve with time. Therefore strong relationships with specialist tropical fruit buyers who understand the needs of these fruit is considered essential to selling rambutan successfully. 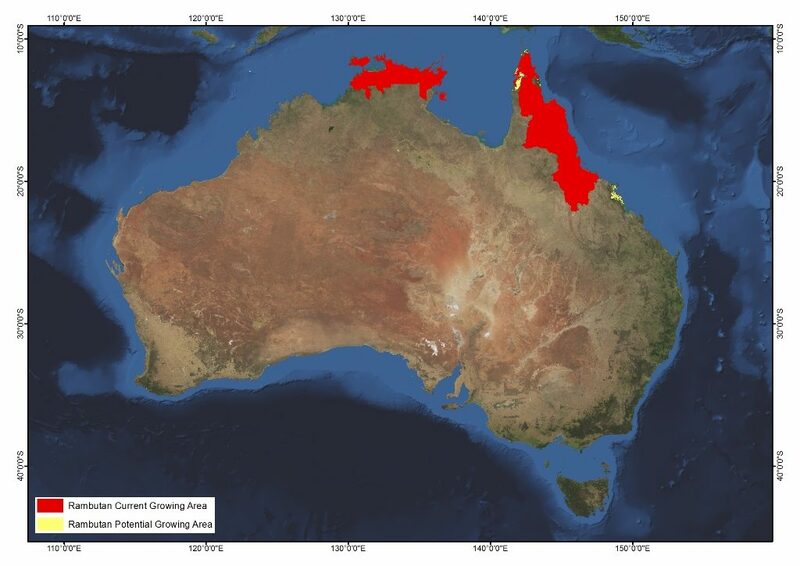 Tropical cyclones pose a considerable risk to primary industries in far north Queensland and the Northern Territory. Cyclones Larry (2006) and Yasi (2011) devastated production areas of far north Queensland around the towns of Innisfail, Tully and Cardwell and inland regions of the southern Atherton Tablelands. 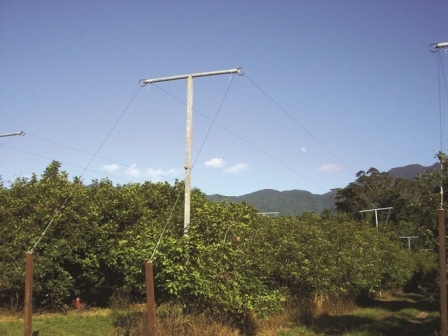 In the aftermath of Cyclone Yasi, a number of Queensland growers left the tropical tree fruit industry. While an understanding of the lessons learned by these cyclone events has been documented, research into cyclone preparedness is still underway with a range of management options, like trellising of fruit trees, being investigated. Since the cyclones, securing affordable insurance is a major challenge to growers in cyclone prone regions with some insurers declining to offer insurance at all leading some growers to put their own risk minimisation strategies in place. Before buying new land to plant orchards, a thorough investigation of the land’s suitability for a horticultural enterprise and its cropping or land use history, should be undertaken. This may include identifying a history of chemical contamination (and residue levels) as some export licences may be withheld on products grown on land where chemical residues exist. Potential disease risks should also be investigated. Some disease pathogens can survive in the soil for many years, so information about previous disease outbreaks will assist determining which trees are suitable for planting. This information can generally be obtained from the relevant state planning authority. Growers will also be responsible for regularly inspecting their orchards for notifiable pests and diseases and reporting any incidence to the relevant state agriculture department. When planting new orchards and establishing additional on-farm infrastructure or access roads, liaison with the state government agencies responsible for planning, native vegetation laws and water licences will be necessary. Some land use applications will also need to be considered by the relevant local government authority. Horticulture and food production businesses have strict requirements in relation to record keeping, registrations, and accreditations as well associated costs for e.g. quality assurance, food safety, safe use of chemicals, environmental performance and intellectual property. Websites like Freshcare may provide a starting point for understanding these requirements.